Does space-time really have four dimensions? Is gravity stronger than people think? For a long time, physicists have assumed that space-time has four dimensions in total – three of space and one of time – in agreement with what we see when we look around us. However, some theorists have proposed that there may be other spatial dimensions that we don’t experience in our daily lives. This might be because we are trapped on some sort of ‘surface’ in the bigger space and so can’t occupy (or even see into) the other dimensions. Or it might be because the other dimensions are so small and looped back on themselves that we don’t notice that every part of our bodies are spread around them. Nobody really knows. But why have theorists suggested this? The answer is linked to another question that has puzzled physicists: why is gravity is so weak? This might seem like an odd statement, since gravity seems pretty strong when you’re carrying heavy suitcases. But when physicists say gravity is surprisingly weak, they are really saying that it is weak compared to electromagnetic forces. For example, a small magnet on your fridge is stronger than the gravitational pull from the entire world! Theorists trying to understand this problem have found a (possible) solution requiring extra dimensions. If there were two or more extra space-time dimensions, then gravity might, in fact, be just as strong as all the other forces. It would just look weak to us because of the way its effects are diluted by the extra spatial dimensions that we cannot usually see. For this reason, scientists in many different fields are trying to track down whether these dimensions exist. If there were two or more extra space-time dimensions, then gravity might, in fact, be just as strong as all the other forces. It is believed that if these extra dimensions do exist, then the LHC could sometimes make microscopic black holes that would be very short lived and would disappear suddenly in a burst. ATLAS is looking for these microscopic black hole events, in order to work out whether the extra dimensions are there. Because nobody is sure exactly what this would look like, ATLAS has a few teams looking for different types of decay of microscopic black holes. 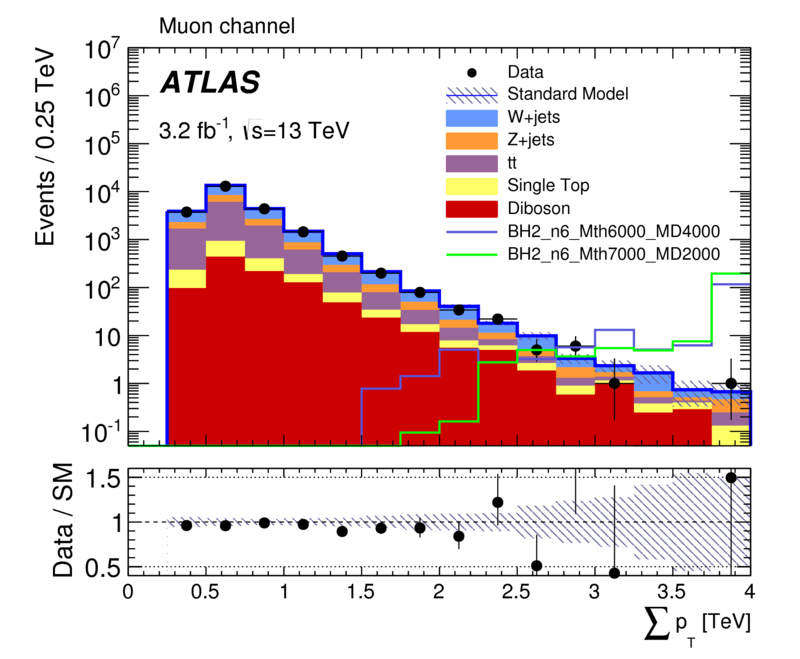 The newly-released ATLAS analysis looks for signatures that contain at least one high momentum lepton, at least three high momentum decay products and “a lot of anything else”. ATLAS physicists searched through all the 13 TeV data taken by the experiment in 2015 and found no statistically significant excess of such events. Figure 1 shows, in the solid colours, the distribution of event-strengths (sum of the transverse momenta of high-momentum objects “∑pT”) that is expected from physics without extra dimensions. The black dots show the distribution that actually appeared in the detector (real data). The two agree quite well. The red and green lines (that are not filled in with solid colour) show the shape of the extra part of the distribution that would appear if there were certain types of extra dimensions. It is noteworthy that for the “green” prediction, some 200 black hole events might be expected in the right-most bin, where in fact only one is seen. Such a prediction is clearly ruled out by the data.